“”They say there are no atheists in foxholes. Well, that's because in the Marines we call them 'Fighting Holes'. Oohrah! Foxhole atheist is a derogatory term applied to atheists who cry out to a god when under duress. Many theists like to tell jokes that imply their belief is correct because the punchline reveals that all atheists run crying back to God when they get scared. Atheist publicly says they he does not believe in a god (see atheist professor myth). Atheist is placed under stress and behaves like a theist (eg, by praying). Therefore, the atheists secretly believes in (my) god. I can feel better about believing nonsense because even atheists believe in my god. It is easy to see that the evidence does not allow for the implication and the argument only serves to bolster a believer's faith rather than present any actual facts. It even implies that the atheist has more intelligence than the theist would give credit for ("If God is good enough for that atheist, He's good enough for me"), following circular logic. The "evidence" as well is in dispute as there are atheists in foxholes, as well as an organization representing them, Atheists in Foxholes for Honor and Recognition. While somebody who is an atheist does not believe in any god, in American culture at least there is a heavy precedent of using 'god' as an expletive. Despite 'Thou shalt not take the name of the Lord in vain' (Exodus 20:7), the term 'God' is often spoken without the gravity that senior godbotherers demand of it. Hearing the words 'oh my god' or 'oh god no' often incorporates them into a person's vocabulary, to be plucked and spit out in times of need regardless of actual belief or lack thereof. It is a sad fact that habits formed in childhood or adolescence plague individuals all through adulthood, and atheists are no exception. Making fun of an atheist for saying 'oh my god' when under extreme stress isn't picking out some hidden desperate belief, but just the cultural saturation of the word 'god'. And it's probably pretty embarrassing and humiliating to the atheist besides. In ideal world, it'd embarrass the Christians who so often take the Lord's name in vain that it is commonplace. If you do it, you're probably a ginormous jerk. As James Morrow said in an interview with Faith L. Justice, "'There are no atheists in foxholes' is not an argument against atheism, it's an argument against foxholes." In the United States at least, nonreligious people are more frequently found in the military than in the general population. Say what? ↑ Segal, David R.; Wechsler Segal, Mady (December 2004). "America’s Military Population". Population Bulletin 59 (4): 25, table 5. Population Reference Bureau, Washington, DC. Retrieved September 13, 2013. Here you are: Atheists in Foxholes on Military Atheists – not necessarily Militant Atheists. 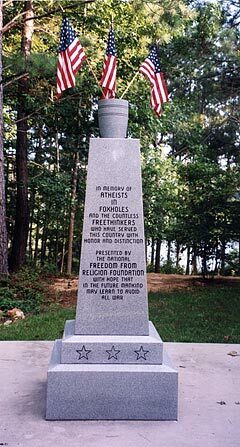 A monument to atheists in foxholes. The Foxhole Atheist. Who says there’s no atheists in foxholes? This page was last modified on 21 September 2018, at 19:48.